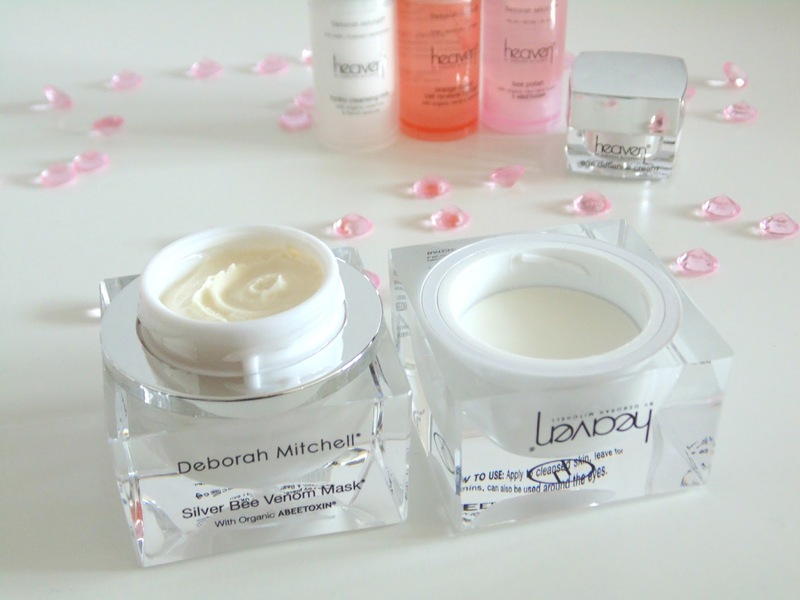 I was first introduced to Heaven Skincare at my event, Big Blogger Conference back in August. Heaven's founder Deborah, is out to conquer the world (literally) with stockists in nearly every corner of the globe, but whilst this is an international brand, the thing I love most about it is how clearly involved Deborah is. Deborah came to our event and spoke most enthusiastically about the brand, really showing her passion for the products. I don't know about you guys but seeing the owner, even after massive success still being involved and going to such a small scale event really makes me love the company more. Anyway... on to the products! Heaven Skincare is synonymous with the famous Bee Venom Mask, being the first skincare brand to use ABEETOXIN. Dubbed as 'Botox in a pot', this cream is popular among celebrities all over the world. Rumour has it, even our Princess, Kate Middleton uses it; and if it's good enough for K-Mid, it's good enough for me! At the Big Blogger Conference, Deborah kindly gifted me some products to try out for myself which was great as I didn't actually get much chance to talk to her about them during the event as I spend most of it running around like a headless chicken. First of all can we just take a moment to appreciate how gorgeous the packaging is on the Silver Bee Venom Mask?! All of the Heaven Skincare products smell absolutely amazing which is a non-negotiable in my eyes when it comes to anything I'm putting on my face! I currently use the Bee Venom mask as a treatment once a week, but I probably should up it to twice. I apply a thick layer before bed and sleep in it. I can noticeably feel my skin tightening up, even after about 10 minutes with it on. I know I have young skin and not many lines to begin with but I feel like this is a great wrinkle preventative as well as a treatment. In the morning after using the mask, my skin is noticeably smoother and feeling a lot more revitalised and fresh. Each of the Weekender Kits contain a cleanser, toner, moisturiser and a bee venom product but depending on your skin type/condition, the exact products vary slightly to tackle your problem areas. As is suggested with the name, the small size bottles are so perfect to take on a weekend away. I actually took mine when on my work trip to Istanbul and Barcelona last week and they were a saviour when I was trying to cut down on the amount of bottle and creams I took with me. I know the brand is on the high end side of skincare but you do get what you pay for and if you ask me, it's a worthwhile investment - especially for the Bee Venom Mask. Check out the whole of Heaven Skincare's range here. My wishlist grows every time I visit the site! im just like you, my products must smell good! These sound really promising, I hadnt heard of it before!